The Museum of transport starts its historical journey on Level 2 which covers the expanding city in the 19th century and the growing demand for public transport solutions. London began to take off as a world city from around 1800 where the population was around 1 million and was rising quickly. By 1900 the population had risen to 4.5 million. Of course all these people needed to get around the ever expanding city and so more modes of transport started to appear. The Thames was a crowded place but not with people but with cargo, however people started to need to be able to cross the river easily. 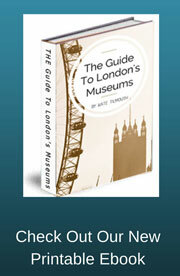 The first public transportation to carry people along the Thames were rowing boats which were managed by watermen. These boats were known as Wherries or water taxis as we would call them. Steam boats were introduced in 1815 and by 1850 were carrying more than a million passengers a year. This museum of transport gallery contains models of some of these early transport vessels as well as early images of the city during the period. The city two hundred years ago was not very large and so many people would walk to get to their destinations. However as the population grew so did the city. Rich people were able to own or hire their own horse drawn carriages and sedan chairs. Some sort of public transport was needed to carry the less wealthy around but the narrow streets of London would cause some issues regarding what vehicles were suitable. During the 19th century two wheeled horse drawn cabs became popular and started to replace the heavier four wheeled hackney carriages which had sprung up to fill the transportation needs of the city. The Omnibus (meaning for all) also became poplar, this was a hail and ride service, the fore runner of today's bus service. A Shillibeer bus can be seen in the gallery. Many different individuals set up their own horse drawn bus services and it soon became over crowded on the streets with all the different coaches competing for business. 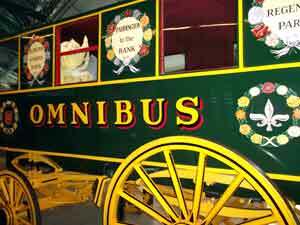 In the end a a single bus company was set up in 1856 called the London general Omnibus Company and it soon became the largest bus company in the world carrying around 100 million passengers a year in 1890. Horse trams, can also be seen in this museum of transport gallery, these are larger vehicles which were pulled along on rails by two horses which allowed for more passengers to be carried. 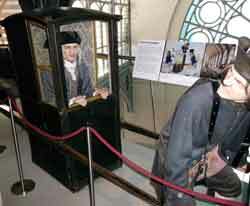 These were introduced to London in 1870 and offered cheaper more convenient travel for the masses. The 19th century was a boom time also for steam trains and new lines from London to all parts of the country were created. Many Londoners during this time lost their homes due to the need to expand the railways into the city and as compensation the railway companies had to provide cheap fares. The museum of transport in London has certainly made a big effort to bring their exhibits to life and to also make it fun to lean about them. The level 2 gallery is not a large space but it is crammed with life sized horse drawn coaches and omnibuses as well as lots of photographic displays. There is even a pile of fake horse dung underneath the horses to indicate just what the streets of London would be filled with. Audio clips can be found everywhere and they automatically play as you walk by, which again brings the gallery to life. I enjoyed this small gallery and it did bring a smile to my face as well as gave me a lot of information about early London and its transport needs. Although I have lived in London all my life, I didn't know much about how people got around during the boom time of the 19th century, I do now.